You are here: Home / Salads / Avocado Tomato and Mozzarella Salad. Avocado Tomato and Mozzarella Salad. I found this recipe on Pinterest a few months ago and I put on my list of recipes that I wanted to make. I had decided that this would be perfect with fresh tomatoes from the garden, so I have been waiting and waiting. But this week we finally had tomatoes that were ripe enough to pick. This recipe came to mind, I put avocados and mozzarella on the shopping list, so I was sure to have everything to make this salad. I made this salad the other evening for dinner and it was as delicious as I thought it would be. It is always nice to find a side dish that has great flavor and that is healthy as well. The salad is probably best to eat right after making it, but I ate the left overs for a couple of days. The avocado will get a little mushy after it sits in the refrigerate, but the flavor is still delicious. 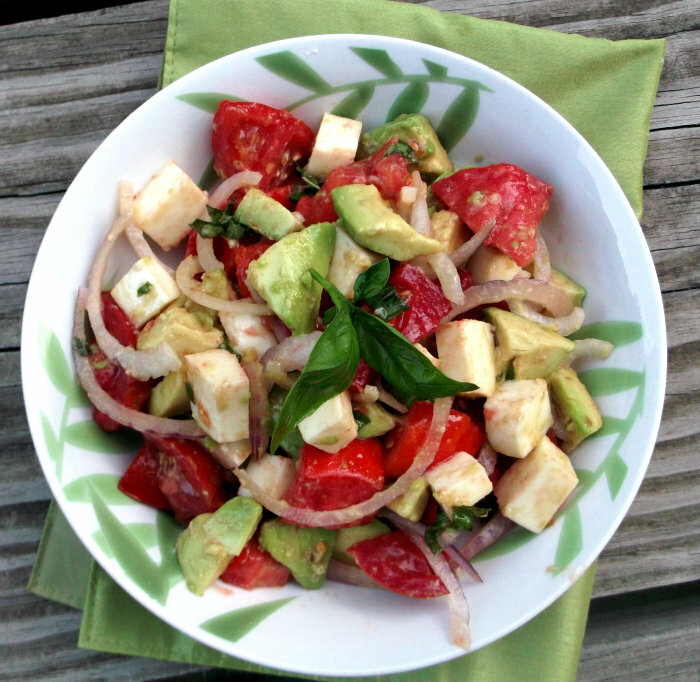 Add the avocados, tomatoes, mozzarella, and onion to a medium bowl. Drizzle with the olive oil and add the basil, garlic salt, and pepper. Toss lightly and serve. 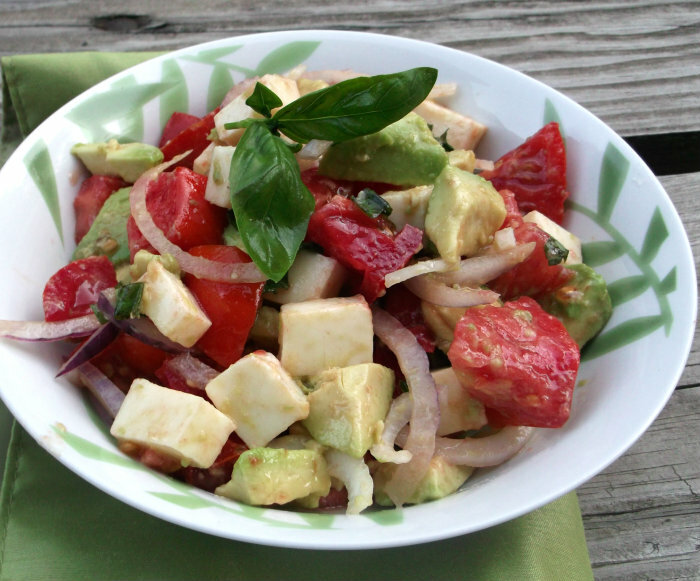 The avocados are such a fun way to dress up caprese! Very refreshing salad and I love avocado! I love Avocado and there’s nothing like the taste of fresh tomatoes. I’d love this salad. Great combo of flavor. 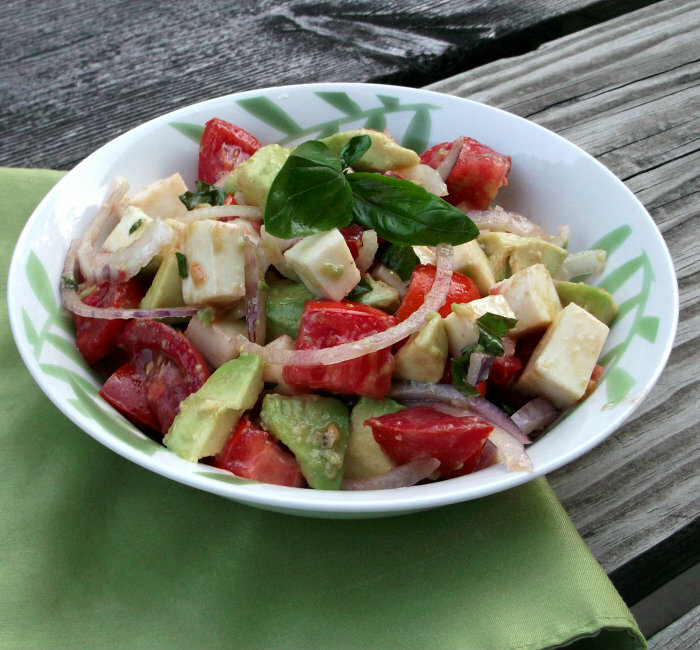 I make tomato and mozzarella salads all the time, but I don’t think I’ve ever included avocado – terrific idea! Thanks. Sounds heavenly to me! I have a gigantic heirloom tomato to use, and your salad looks like the perfect solution! Hope you’re enjoying the holiday weekend, Dawn! I just happen to have all of the ingredients for this salad. YUM!